Looking for something new to throw in the crockpot? 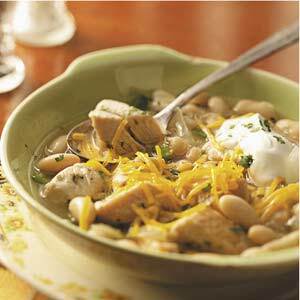 Try this White Chicken chili recipe to warm you up from the inside out! YUM! Mix onion, garlic, chicken broth, cumin, oregano, salt and Tabasco in 3 1/2 to 6-quart crockpot. Add chicken thighs. Cover and cook on LOW for 4 1/2 to 5 1/2 hours, or until chicken is tender. Remove chicken; remove meat from bones and chop or shred chicken. Discard bones and return chicken to crockpot. Stir in beans, corn, and cilantro, if using. Cover and cook on low 30 minutes or until thoroughly heated. love cooking in my crock pot, always looking for more recipes! Can you use chicken breast? I dont car for thighs…..